Name: Each shift tag name can be up to 32 characters in length. Code: The 'Code' allows you to decide which 2 letter abbreviations to use for each shift tag. 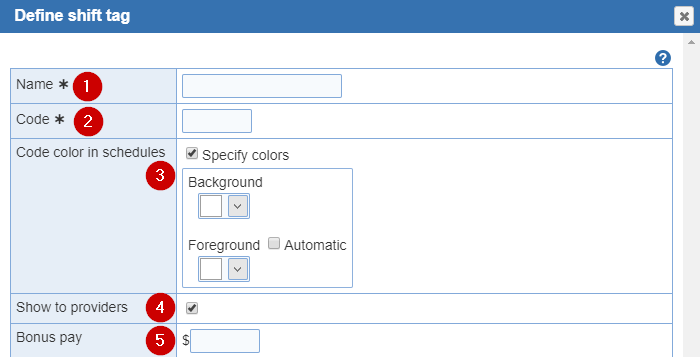 Code color in schedules: (Optional) Here you can specify the color for this shift tag. Select the drop down to pick a color. You also, have the option to pick a 'Custom' one. Bonus pay: (Optional) Specify bonus pay for specific shift tags. Tag Edit: Select one of the shift tags to edit.The 'Tag Edit' button is located within the 'Manage Tags' screen. The 'Define shift tag' window will open.Here you'll be able to modify the 'Name', 'Code', 'Show to providers', 'Code color in schedules, and 'Bonus pay'.